State troopers process some 350 demonstrators, including Tom Schmidt ’68 and Michael Szpak ’68 (spotlighted, from top), into custody on March 19, 1965, behind Selma City Hall. The demonstrators had attempted to picket the house of Selma’s mayor. Photograph: Associated Press. Click image to enlarge. Situated along the banks of the Alabama River near the center of the state, Selma, Alabama, was a segregated town with an adult population of 15,000 blacks and 14,400 whites in 1964. More than 80 percent of the blacks lived below the poverty line, and less than two percent were registered to vote. The Civil Rights Act of 1964 banned racial discrimination in setting voter qualifications, but Governor George Wallace and fellow segregationists found ways of using literacy tests, poll taxes, and other tactics to hold down black voter rolls. In Selma, the registration office at the county courthouse was open just two days a month. And when the Student Nonviolent Coordinating Committee (SNCC) attempted a registration campaign there in July 1964, a state judge issued an injunction prohibiting any “assembly of three persons or more in a public place” sponsored by a civil rights organization. Within a month more than 3,000 people were arrested, Dr. King among them. Then, on February 18, in the nearby town of Marion, 500 demonstrators took to the streets in a peaceful SCLC-led protest. State troopers attacked the crowd, mortally clubbing and shooting Baptist deacon Jimmie Lee Jackson. It was a galvanizing assault. Plans took shape for a 54-mile march, east from Selma to the capitol building in Montgomery. There would be three attempts in all. To ensure that the governor and the national media paid attention, the SCLC and SNCC recruited extra marchers, many of them clergy and college students from the north. The prisoners, including 12 Boston College undergraduates and one professor, had been arrested en masse earlier in the day while convening to picket the home of Joseph Smitherman, the mayor of Selma, after he had refused to provide escorts for African-Americans trying to register to vote in town. Just 12 days earlier, on March 7, which had come to be known as Bloody Sunday, troopers had attacked some 600 civil-rights demonstrators, led by Student Nonviolent Coordinating Committee (SNCC) chairman John Lewis, as they tried to march, for the first time, across the Edmund Pettus Bridge—named after a Ku Klux Klan Grand Dragon—just four blocks from City Hall, on their way to Montgomery. On foot and horseback, the troopers had unleashed attack dogs, fired tear gas, charged the demonstrators, and struck them with nightsticks and bullwhips. Footage of the scene appeared on the national news that night, and in the days that followed, more than 25,000 men and women traveled to Selma to express their solidarity with the demonstrators. Which is how those 12 students, 11 men and one woman, found themselves detained behind City Hall. The idea of going to Selma had occurred to Gundersen only four days earlier, on March 15, a snowy Monday morning in Chestnut Hill. He and his friend Gerard Kiley ’65, MSW’74, both English majors and editors for the Heights, were drinking coffee in the Lyons Hall basement cafeteria, killing time before their 9:00 a.m. classes. One of them, probably Gundersen, was reading a front-page Boston Globe story about a memorial rally that had been held the previous afternoon on Boston Common for the 38-year-old Unitarian-Universalist minister James Reeb, who had traveled from Boston to Selma on March 9, only to be beaten to death with a pipe by white segregationists. The event had sparked demonstrations from Chicago to Budapest, but in Boston, where 25,000 people turned out, it was personal: Reeb was a community organizer in Roxbury, and he and his wife and four children were well-known in the community. After the murder, students and faculty at Harvard, Northeastern University, and Boston University had donned black mourning armbands and joined silent marches from their campuses to the memorial on the Common. Nothing of the sort happened at Boston College. It was a more provincial place: Catholic theology still dominated the core curriculum; men were required to wear a jacket and tie to class; women wouldn’t be admitted into the College of Arts and Sciences for another five years; and Doris Day musicals served as Friday-night entertainment in Devlin Hall, as one graduate recalls. The greatest display of activism in Boston College’s 100-year history had occurred not long before, on December 3, 1962, when some 3,500 students, Kiley among them, marched from campus down Commonwealth Avenue toward Cardinal Richard Cushing’s residence. “Give us what we deserve!” they had chanted. What atrocity were they protesting? The University’s decision not to play in that year’s Gotham Bowl. “Isn’t this bowl beneath your dignity?” Cushing said, and sent them away. From left: Gundersen, Hayden, Downs (née Flagg), Peter Lareau, Jay Bryant, Richard Lareau, Michael Greene, McGough, and Kiley beside their station wagon on the Chestnut Hill Campus on March 16, the day they left for Selma. 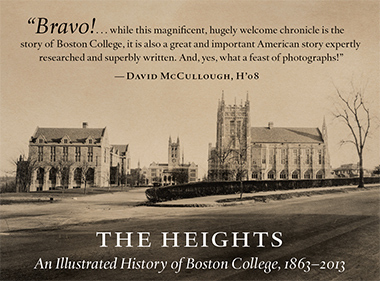 Photograph: The Heights. Click image to enlarge. Gundersen and Kiley, both longtime Massachusetts residents who remain friends today, were two of the more well-informed students on campus. Because they sometimes reported for the Heights on the strikes taking place at other universities over tuition, women’s rights, or racial discrimination, their classmates considered them progressives. They only learned of the Reeb memorial, however, upon seeing the report in the Globe. Not everybody said yes, of course. According to Kiley, one senior editor for the Heights wanted to go but declined, fearing what his neighbors in South Boston would think of him if they found out. But by that afternoon four more students had joined the group: the brothers Peter Lareau ’65, JD’68, and Richard Lareau ’68, from Fairport, New York; Marsha (Flagg) Downs, from Revere, who worked in the computer center and took classes in the Evening College; and Belmont native Jay Bryant ’65, a former member of the conservative student club Young Americans for Freedom. What next? The students didn’t know, so they called the young Harvard theologian Rev. Harvey Cox, whom Dr. King had appointed to coordinate the travels of all Selma-bound protestors from Massachusetts—a group that ended up numbering more than 800. Already in Selma, Cox told the students to attend a nonviolence training session that evening in Roxbury, at the local headquarters of the Southern Christian Leadership Conference (SCLC). Gundersen, Kiley, and Hayden went and learned how to curl on the ground to protect their head, testicles, and internal organs. Hayden remembers that a Baptist minister, the Rev. Bill England, concluded by saying, “There is one thing I can promise you: You’ll never be the same again after you’ve gone to Selma. May God go with you.” The SCLC hadn’t yet set a date for the next march attempt, but Cox advised them to get to Alabama as soon as possible. Undeterred, Gundersen called Avis and rented the biggest car he could, a seven-seat station wagon. And at 2:00 p.m. on Tuesday, March 16, the nine members of the Heights group grabbed their sleeping bags, crammed themselves into the car, and hit the road. Two days after Bloody Sunday, on what national media would soon call Turnaround Tuesday, March 9, Dr. Martin Luther King Jr. and 2,500 demonstrators began a second attempt to march to Montgomery. But a federal-court judge for the middle district of Alabama, Frank Johnson, issued a temporary restraining order, so the demonstrators halted and turned around peacefully, at the same bridge where many protestors had recently been attacked. Judge Johnson would deliberate for days before lifting the ban, as thousands of additional demonstrators from around the country converged on Selma for a third attempt to march. Nineteen-year-old Thomas Schmidt ’68 heard the speech broadcast over the intercom in the McElroy Commons basement. He had just finished studying for the night, and he paused to listen. The civil rights movement was an interest of his. To keep up he subscribed to the muckraking newsletter I. F. Stone’s Weekly—in part, he recalls, to “needle” his conservative father. He continued down the hallway and noticed that the Boston College Sodality, a community-service and spiritual formation group run by Jesuit faculty, had posted a signup sheet outside its door for students interested in marching in Selma. English professor Francis X. Shea, SJ, a Dorchester-born priest who had recently been pressing the University to recruit more African-American students, was to lead the trip. The fact that the Sodality was organizing the journey appealed to Schmidt, who now practices law in Harrisburg, Pennsylvania. “It gave the trip much more of a spiritual spine,” he says. “It wasn’t just a street tactic.” He added his name. Sixty-three Boston College students signed up. More than 40, however, didn’t meet the SCLC’s requirement that they receive their parents’ permission and ensure access to $500 so that they could post bail if arrested. Others dropped out after attending the nonviolence training session in Roxbury, where they were made fully aware of the dangers of confrontations with state troopers. This SNCC meal card admitted Gundersen to two church kitchens. Photograph: Gary Wayne Gilbert. Click image to enlarge. With the money they raised, the Sodality group was able to charter a Greyhound bus with other marchers, set to return Saturday, March 20. They boarded the bus at 10:45 on Tuesday evening, nine hours after the Heights crew left town, and settled in for the long ride to Montgomery. The next day, March 17, near Atlanta, Georgia state troopers caught sight of their northern plates and pulled them over for questioning. Jay Bryant, the driver for much of the trip, told the officers they were on vacation, and after a few minutes they were sent them on their way—but not before the officers’ accents made clear to the students just how far they’d already traveled from Boston. “All of a sudden,” Hayden says, “the seriousness of what we were doing sank in.” In the evening, passing through Montgomery, they saw the Confederate flag flying atop the capitol dome. That afternoon, Judge Johnson had lifted the injunction. In fact, he’d called the right to march “commensurate with the enormity of the wrongs that are being protested.” Dr. King and the SCLC at last set the march for Sunday, the 21st. The Heights crew was thrilled and anxious, but the timing would disappoint the Sodality contingent, who had committed to returning to Boston by bus on Saturday. At 9:00 that night, after driving nonstop, the Heights group arrived in Selma and headed straight for the Green Street Baptist Church, where Cox, their one contact in the South, had told them to find him. Church staff welcomed the men in and let them crash on the basement floor, along with a couple hundred other male demonstrators. Downs, the only woman, was escorted to the home of a black family that had volunteered to quarter marchers. On Friday morning, following the orders of James Bevel, the SCLC director of direct action and nonviolent education, the Heights crew and three members of the Sodality group (the rest happened to be in church) set out on their first mission: In small groups, teaming up with black activists, they strolled through a white neighborhood, trying, as Bevel put it, “to arouse the consciences” of the residents. The detainees were released the following morning, Saturday the 20th, at which point they learned that President Johnson had agreed to federalize the National Guard to protect those marching from Selma toward Montgomery the next day. That evening, Kiley ran into another Boston College student: Leo Haley, a graduate student at the School of Social Work. Haley, who back in Boston volunteered for the Catholic Interracial Council, had raised enough money from classmates to fly to Selma on Tuesday morning. His appearance alarmed Kiley. Earlier in the evening, Haley said, he had been walking to a planning meeting when two white teenagers stopped him. “Why did you come down here?” they asked him. Before he could answer, one of them grabbed him and held him down, and the other pulled out a safety razor and sliced a two-and-a-half-inch “X” into his right jaw. “Something to remember Selma by,” they told him. “Leo was an innocent, trusting soul,” says Kiley, who had gone to St. Clement High School with him. After hearing Haley’s story, he offered him some advice. “This is like a war zone,” he said. “The goal is to survive. You have to be more careful.” After talking to his parents, Haley decided not to take part in the upcoming march, and flew home the next morning—by which time most of the students in the Sodality group were themselves begrudgingly also en route to Boston. Bryan Gaynor, however, decided he would stay. On Sunday morning, the Heights group awoke early. The men donned the sport coats they usually wore to church, Downs put on a skirt, and at about 8:00 they headed over to the Brown Chapel A.M.E. Church about a mile from the bridge. By the time Dr. King arrived, three hours later, some 3,200 marchers had assembled, and at 12:46 the march began, led by a collection of high-profile activists: Dr. King; the Nobel Peace Prize–winner Ralph Bunche; Ralph Bevel and the civil-rights leaders Ralph Abernathy, Rabbi Abraham Joshua Heschel, and John Lewis; and Cager Lee, the murdered Jimmie Lee Jackson’s 82-year-old grandfather. Nineteen armored jeeps and four military trucks trailed the marchers; two helicopters hovered above. At that point, Gaynor noticed a Confederate flag sewn onto the guardsman’s chest. All the guardsmen in the area, he soon realized, had one. Kiley was asked to lead 20 local black kindergarteners. “I kept running circles around the group to keep them together,” he says, “like a cowboy in a Western.” They asked Kiley about life in the North. What was snow like? Could they go to college? Would they be treated any better up there? By 5:00 in the afternoon, the marchers had traveled seven miles and stopped for the day, 47 miles from Montgomery. Highway 80 narrowed to two lanes at that point, and only 300 demonstrators would be permitted to march the remaining distance, per Judge Johnson’s order. For the Boston College students, it was the end of the march. That evening, in a field on the side of the road, they ate cornbread, spaghetti, pork, and beans with the rest of the marchers, and then made their way back to Selma, where they spent the night. At dawn, they stuffed themselves back into their station wagon, filled the tank at the one black gas station in town, and headed home. The Heights crew, the Sodality group, and Leo Haley returned to campus changed. Newly sensitive to the racial inequality that plagued their own city, some started tutoring in Roxbury. The same week he returned, Gundersen, who had planned to be an English teacher, rushed an application to Boston College Law School and enrolled the following fall. He earned his JD in 1968 and has represented afforable-housing projects in Dorchester and Roxbury ever since. Gaynor had planned to be an accountant, but he, too, decided to become a lawyer: He attended Columbia Law School and has practiced as a public-interest attorney in California since the mid-1970s. “Selma changed my whole direction in life,” he says. Gray, Schmidt, Hayden, Peter Lareau, and Philip McCough also chose to pursue legal careers. Marsha Downs dropped out of Boston College after her freshman year and returned to Selma, where she helped African-American residents register to vote until the following June, which was two months before Congress passed the Voting Rights Act. Kiley earned a master’s in social work at Boston College and then served in Boston’s division of child guardianship for a decade before taking up his current occupation as an information-technology executive. Greene earned a Ph.D. in African literature and taught English at colleges throughout New England for 40 years; Szpak became a Methodist minister and has worked for the AFL-CIO for 28 years. Two of the students died not long after Selma: Jay Bryant was killed in a car accident in Boston only seven months after the march, at 23, and Leo Haley died of heart failure in October 1966, at 24. (Haley House at Boston College is named for him.) Richard Minisce, who served in the Peace Corps and was a New York social worker before becoming a real estate agent in Oregon, died of ALS in 2007. After Selma, the Heights began paying more attention to the civil-rights movement. Between April and December of 1965, the paper published twice as many articles on the subject as it had in the previous three years combined—many of them written by Kiley, Gundersen, and Szpak. The editors repeatedly interviewed Robert Drinan, SJ, the dean of the Law School and an activist who criticized the University for its “basic inequality and racial imbalance.” Ad spaces normally reserved in the paper for oxford shirts and pool halls were replaced with announcements of local SCLC meetings. The Sodality helped bring civil rights leaders such as Julian Bond to campus to speak. In the fall after Selma, Szpak became the founding co-director of the Sodality’s Project Opportunity, a program to help local underserved African-American high school students prepare for and apply to Boston College. In 1967, Jesuit Superior General Pedro Arrupe wrote to U.S. Jesuits, demanding that they minister to underserved African-Americans and provide them with “special scholarships.” The next year, the University began the Black Talent Program, offering $100,000 in full four-year scholarships, and the undergraduate black population quadrupled the following fall, to about 45. Black students themselves ran the program for five years, admitting more than 300. In 1980, the program dissolved, and the Office of AHANA (African-American, Hispanic, Asian, and Native-American) Student Programs opened, which continues to offer minority students academic support and career counseling as the Thea Bowman AHANA and Intercultural Center. Thirty-two percent of the undergraduate student body today is minority. From left: Gundersen, Kiley, and Gray, in McElroy Commons on January 23, 2015. Photograph: Gary Wayne Gilbert. Click image to enlarge.